PHILADELPHIA (WPVI) -- The Philadelphia Phillies have signed Scott Kingery to a six-year contract through the 2023 season, General Manager Matt Klentak announced Sunday. The deal also includes three club options for the 2024, 2025 and 2026 seasons. 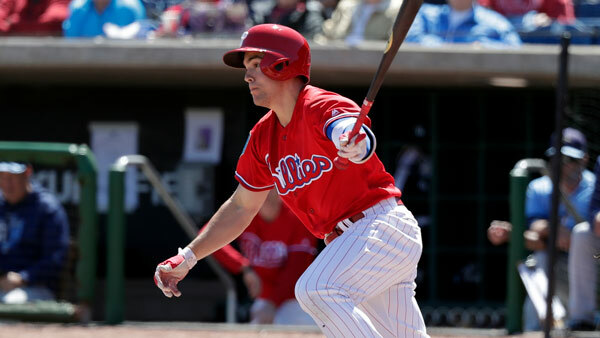 Kingery, 23, has appeared in 20 games for the Phillies this spring and is batting .392 with a .415 on-base percentage and .725 slugging percentage over 53 plate appearances in Grapefruit League play. He is currently tied for the Grapefruit League lead with 20 hits and ranks tied for third with 37 total bases. Last season, Kingery appeared in 132 combined games between double-A Reading and triple-A Lehigh Valley, slashing .304/.359/.530 with 26 home runs, 29 doubles, eight triples and 29 stolen bases. He was the only player at the major or minor league level to have 25 home runs and 25 stolen bases. Originally selected by the Phillies in the 2nd round of the June 2015 draft out of the University of Arizona, Kingery won the Paul Owens Award last season as the top position player in the Phillies minor league system. Additionally, he committed just six errors in 529 total chances for a .989 fielding percentage and was awarded the minor league Rawlings Gold Glove Award for 2nd base. Kingery is currently ranked by MLB.com as the 35th-best prospect in baseball and the number two prospect in the Phillies minor league system.